Are you feeling overwhelmed by all the work piling up after each and every shoot? Are you drowning in a mountain of never ending production work? Do you wish you could quickly improve the quality of your work so you could raise your rates? Want to know one of the secrets to quickly improving the quality of your work without doing any extra work? In a word, edit. If you are giving your clients everything that comes out of your camera, or most of it, you are doing a disservice to yourself, your brand, and your client. Let me explain. Imagine you are out at a fine restaurant, and you’ve just ordered a lovely meal. Now imagine that along with your meal, the server also brings out all the food scraps, peelings, leftovers, etc. that was used in making your meal. Not too tasty, right? Why would you want to see the scraps, the garbage leftover from making your beautiful meal? Wouldn’t that kind of ruin the experience of a finely crafted dinner? It’s part of the experience the presentation of that meal? It is the same with photography. Everyone shoots some garbage. But why would you give that to our clients? Are you unqualified to sort the good stuff from the trash? If you can’t do that, you have no business calling yourself a professional. Don’t delude yourself into thinking that only your client knows how they look best or that only they can choose which of the 20 cake shots is the best. Scenario A-you put the entire engagement session online, about 600 images in total. 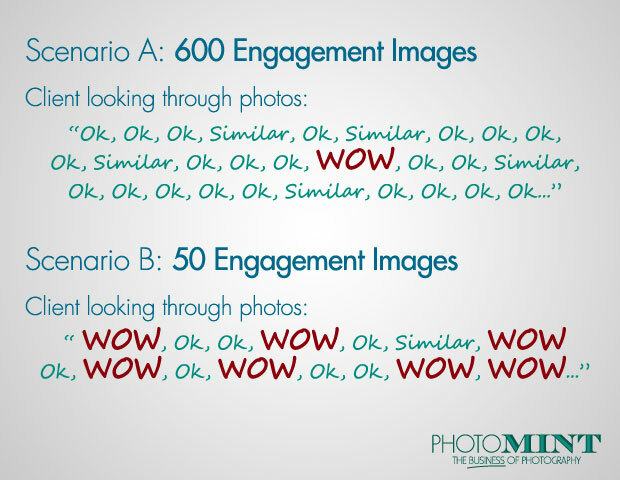 Your client gets to slog through all 600 images, reviewing 10-15 ok-mediocre images to 1 good one. 1 in a 100 is awesome. But they have had to look at all these images that are practically the same, and they have trouble picking out the best ones, it’s completely overwhelming for someone not using to editing. Plus somewhat disappointing to see so many so-so images. It takes them a long time to get to a wow shot, and at this point, they are so overwhelmed, it’s hard for them to recognize the really great shots. Scenario B-you do a tight edit, only making the 50-70 best available, everything else goes in the trash. Now, when your clients look at these, every shot is a good one, and there are a lot of “wow” shots in there too. The quality of your work just improved drastically, because now your best work stands out, and your worst shots are pretty good. Every photographer has mediocre shots, things that didn’t work, out of focus shots, images where we forgot to place the subject in a flattering pose, etc. The smart photographers just throw that crap out. It’s hard to do, I know. But it has to be done. This article has helped me in so many ways! Since I first read it a few months ago I have cut down my post production, and, I think, presented a better product. Thank you so much!!! I’m not a wedding photographer but that was a great article. Thanks Oscar, what kind of photography business do you have? This article is a really helpful one to all the photographers who struggle with culling images. of course, at times we contemplate whether to do it ourself or leave it to the customer. So, better put extra time to edit images and give clients a better experience. I batch into Lightroom – filter out the fuzzies, the darks, the shut eyes and the weird faces … Once I have only got average and above photo’s in the line up I then plug the lap top into the television and flick through on the big screen. As you are flicking through if you immediately don’t like it – apply another filter – when you have multiple shots of the same pose/set/item – you can then see up close and personal and keep the best ones. Filter out the others. Once you have done this you are left with your core shots to finish editing. If I don’t do this I find it hard to focus and end up wasting time on shots I should have culled right at the start. Thank you. Now I can plan my photo shoots more wisely and choose only the best. One can become emotional and want to give more pictures as often my client will say “but you took hundreds, why can’t I have them all” No longer will I now. WOW!!! this is an amazing tool for photographers. I wish something like this had been around years ago. Thank you for letting me use what you have created it will be invaluable. We tend to become complacent about most things and this book gives me a kick up the backside and stirs up the creativity in me. I love looking at your style of photography it opens up a desire to make great images. Glad to hear it’/s working for you Billy. You are so right, it’/s easy to become complacent, and there are a lot of reasons in this industry to feel sad and depressed (plethora of amateurs willing to do our work for free, economy, etc.) but on the other hand, there is a lot of room for improvement and growth. I think as creatives, we all need to be inspired to take things to the next level, and also to stay focused on the photography business side of things, so we can earn a comfortable living. Oh I know, I know! It can be hard to do, but it’s the best thing for you AND your clients. I really like the analogy of the restaurant serving all the scraps. I’ll always remember that now when I’m culling through the images. Next post: Want to Make Some Extra Holiday Cash This Year?